On door knobs, dishes and books. and my dear friends, with love. Once upon a time a daughter complained to her father that her life was miserable and that she didn’t know how she was going to make it. She was tired of fighting and struggling all the time. It seemed just as one problem was solved, another one soon followed. Her father, a chef, took her to the kitchen. He filled three pots with water and placed each on a high fire. Once the three pots began to boil, he placed potatoes in one pot, eggs in the second pot, and ground coffee beans in the third pot. He then let them sit and boil, without saying a word to his daughter. The daughter, moaned and impatiently waited, wondering what he was doing. She did and noted that they were soft. He then asked her to take an egg and break it. After pulling off the shell, she observed the hard-boiled egg. Finally, he asked her to sip the coffee. Its rich aroma brought a smile to her face. “Father, what does this mean?” She asked. He then explained that the potatoes, the eggs and coffee beans had each faced the same adversity–the boiling water. However, each one reacted differently. The potato went in strong, hard and unrelenting, but in boiling water, it became soft and weak. The egg was fragile, with the thin outer shell protecting its liquid interior until it was put in the boiling water. Then the inside of the egg became hard. However, the ground coffee beans were unique. After they were exposed to the boiling water, they changed the water and created something new. “Which are you,” he asked his daughter. “When adversity knocks on your door, how do you respond? Are you a potato, an egg, or a coffee bean?” In life, things happen around us, things happen to us, but the only thing that truly matters is what happens within us. We want to give credit where credit is due. We don’t know who the author is of this poem. If you know of the author please contact us. Then I shall hold you high. A shining leaf above a thousand seeds sown wild. Not my planting. But by heaven, my harvest. Created with His love n’ care. As you became an answered prayer. And blessed it with a smile. So many things I wouldn’t want you to go through. Knowing this is the best for you. 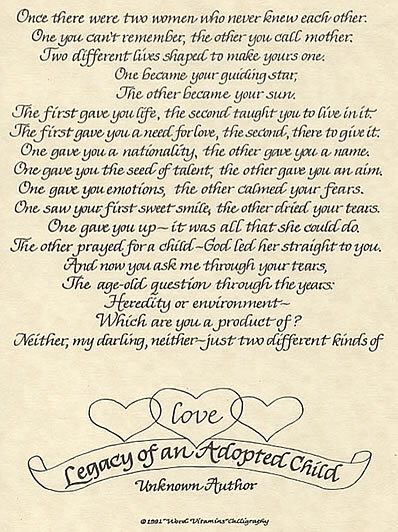 This poem was written by one of Lifetime Adoption’s birth mothers. She is a wonderful young lady, which like most birth mothers truly loves their child and was going through an adoption plan because of that love. She has since moved on and has begun working again in a small office environment. She has begun counseling along with her husband to stabilize their marriage and future personal growth. She also plans on taking advantage of the Lifetime Foundation Scholarship Program. They do plan to have children in the future, but cannot at this point in their lives and marriage. We at Lifetime wish them the best of luck in the future. “Once there were two women who never knew each other. One gave you a talent, the other gave you an aim. The other prayed for a child – and her hopes were not denied. To let go doesn’t mean to stop caring. To let go isn’t to cut myself off. Rather than to enable…it is to allow learning from natural consequences. Letting go is to admit powerlessness. Meaning the outcome is not in my hands. It is not to try to change or blame another; but knowing that I can only change myself. Instead of caring for, it is to care about. It is to be supportive instead of to fix. To allow others to affect their own outcomes, instead of being in the middle arranging all the outcomes. It is not to be protective but to permit another to face reality. Not to nag, scold or argue, but rather to search out my own shortcomings and to correct them. Each day as it comes and to cherish each moment. To fear less and to love more.